What model would you like to enquire about? Our all NEW SUV GT – Grand Tourer camper is our latest top quality camper on the market today! FLUSH MOUNTED DOOR AND DOUBLE LOCKS. Offers superior sealing. Doors that are flush mounted have to only seal the water and dust that go into the door gap as compared to doors that protrude out having to stop all the water and dust that land on the seal, this is nearly impossible. ALL MAIN HINGES GREASE-ABLE, not riveted on. WINDOWS SHADES ON ALL WINDOWS. Can leave more windows open when raining. SUPERIOR NEW PANTRY WITH S/S FOLD DOWN TABLE WITH 3 PANTRY DRAWERS. 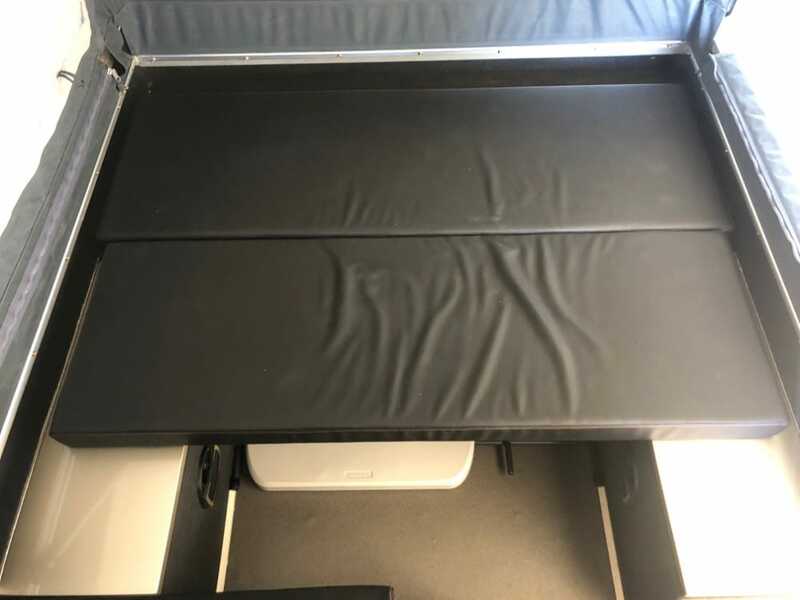 Also fits 80 litre Engel fridge and has front support legs and lock out slide. DEEP CYCLE BATTERIES 2 X 100 AMP STORED OUT OF THE MAIN CAMPER in a special box on the side. Some companies store the batteries inside the campers near the bed areas where you sleep. GALVANIZED SUSPENSION ARMS. Painted suspension arms may RUST. GALVANIZED TYRE CARRIER AND BIKE RECEIVER. Some campers have painted carriers & receivers and they may RUST. EXTRA 100 LITRE WATER TANK AT BACK. Total water = 200 litres. The extra back water tank has been designed by SUV campers and is patent pending. It also acts as a ball weight adjuster and takes some weight off the tow bar when the back tank is full. HEAVY DUTY 6 MM CROSS BEAM ON THE CHASSIS where the suspension is mounted. Don’t settle for a light chassis that has only 3 mm cross beam! NEW UPGRADED SERIES 3 FULL OFF ROAD GALVANIZED SUSPENSION ARMS WITH BOLT ON STUBS, 3 TONNE AXLES AND 12 Inch BRAKES. In-house design. Larger nylon 6 bushes, larger centre pin, with compression locking sleeve. Wall thickness on the suspension housings are 15mm thick on side walls. Some companies use 4mm RHS, cut and welded onto the suspension arm and they have a moulded poly bush fitted. The 4mm RHS have been failing on some suspensions. ALUMINIUM POLES LIGHTER and DO NOT RUST. We use Aluminium Poles on our campers, these stop the rust. In Queensland, you get a lot of condensation in the air and the steel poles may rust after a period of time. SIDE WALLS EXTRA HIGH on main body also increases the fridge box height so you can fit a larger fridge. When the side of the body is lifted the camper closes easily, meaning you can close it up with the annex roof left on. INNERSPRING MATTRESS 100mm QUEEN SIZE IN FRONT AREA, NOT 80MM FOAM, because there is plenty of clearance for our higher lid to close. EXTRA HIGH 3MM ALUMINIUM PAINTED ROOF FOR EASY CLOSING. Our roof is made higher so the mattress fits inside the lid. DIMMER SWITCHES ON ALL READING LIGHTS. Dimmers on all the inside lights. You can dim and turn off the lights if reading and not have to get up to turn the main switch off. ONE WINCH FOR EASE OF OPENING AND CLOSING. One person can set/pack up. 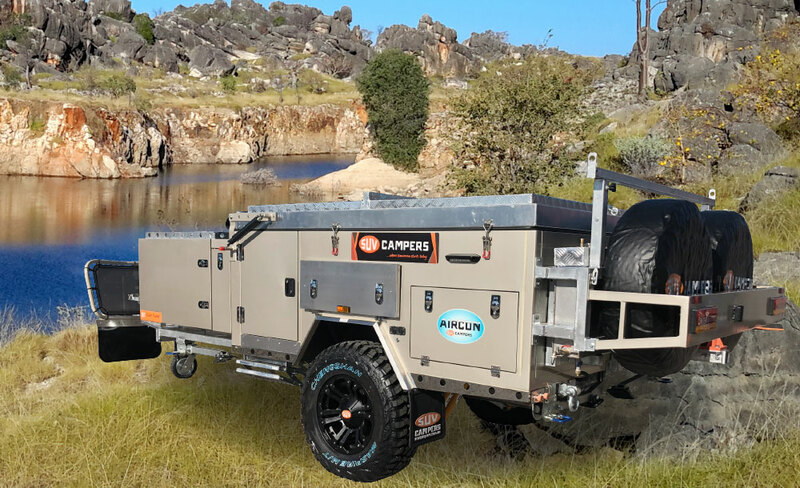 Some other campers have two winches, one at the back and one at the front requiring two people to open/close the camper. If the lid isn’t made strong enough to hold the gas struts or if you only use the front winch to open/close the camper, the lid may come crashing down and could cause injury. Our lids are designed and reinforced to accommodate the correct gas pressure in the gas strut, which is engineered to accommodate the weight of the lid, therefore requiring one winch and one person to open/close. 25 AMP SMART CHARGER to charge the 2 x 100 amp deep cycle batteries. Some companies do not supply smart chargers. Some only supply small ones, this results in batteries going flat. Best to have around 10 amp per 100 amp battery. 25 amp smart charger is recommended and standard with our campers. AUSTRALIAN DESIGN SWING OPEN DOOR AND FOLD OUT HEAVY DUTY GALVANISED STEPS. 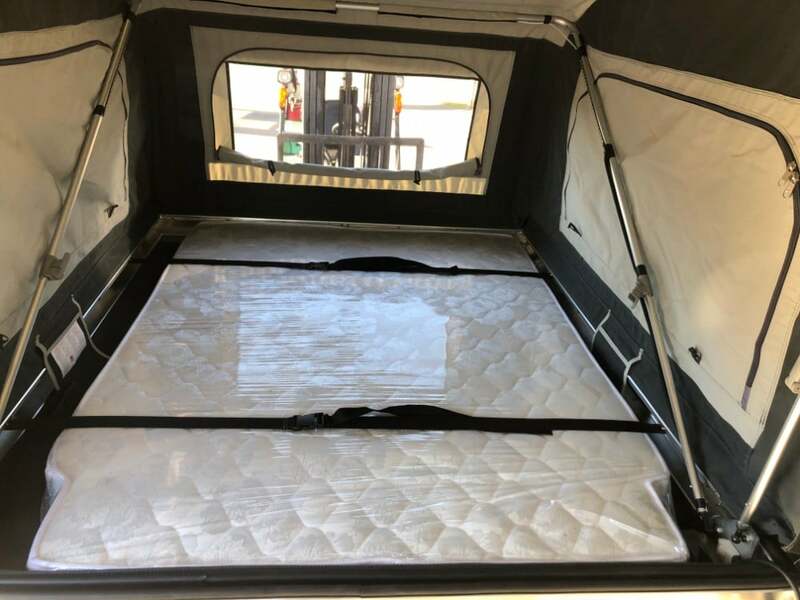 Cannot be compared to light duty fold out steps or “Chinese” drop down door that may bring mud into your camper when closing in rainy weather. FULL CANVAS TROPICAL ROOF. No cheap silk imitations! NO NEED TO ADJUST POLES IN MAIN TENT just push out the back bow and its ready to use. Our tent is custom designed and manufactured for easy set up. Other campers may require you to adjust all the bows to open/close and even add support bars to the roof. Poor tent design results in complicated, time consuming set up and packing up. SELF SUPPORTING BED CUSHIONS. Provides added storage as a table isn’t needed to support the cushions resulting in loss of storage space. ENSUITE, CUSTOM MADE. Zips and Velcro’s onto the back of the main tent. High quality with ample standing room. Double seal on main lid for superior sealing. Sign up to our mailing list to receive exclusive offers & specials!